C.R.U.S.H. Community was founded in 2003 to raise money for worthy causes. A different cause is chosen each year and we hold a fund-raising event in San Mateo. A representative from the group to whom we are donating money attends and gives a presentation on the work the group does. 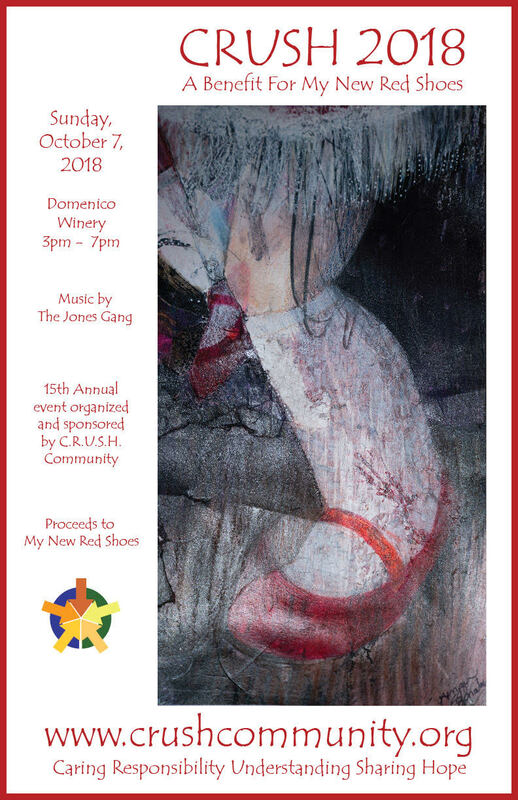 We will hold our 15th event, CRUSH 2018 on October 7th, 2018 from 3-7 at Domenico Winery in San Carlos. Tickets are $60 and will be available in mid-August. Call John at (650) 245-6555 or Gale at (650) 678-0493 to reserve tickets or get involved. You can also send email to John or Gale. The fundraiser includes dinner, drinks, an auction, raffle, friendship quilt game, posters, live music and great people. An amazing group of people work together to make this event possible every year. This will be a fundraiser for My New Red Shoes. Since 2006, they have provided more than 57,000 homeless and low-income children in the SF Bay Area and Greater Portland with new shoes, new clothing, and a positive start to their school year. about each other in a human way.